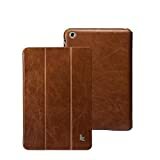 Found 39 Tuff Luv Leather Ipad Products. 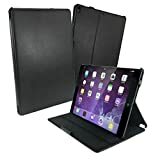 The Tri-Axis is the product of 5 years' of feedback from customers to improve the design of this multi-functional iPad Pro 12.9" (2016 & 2017) black case.It was Originally nominated by MacWorld for their 2010 for "Best iPad Accessory".A great design that offers multiple viewing angles on each side both vertical and landscape.Our premium case includes a sleep function to conserve your battery when your tablet in use. 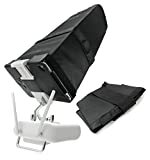 Just open or close the case and it will wake or sleepThe versatile stand allows you to adjust the cases into multiple different positions to securely support your device no matter how or where you are using it. You can stand it up in landscape, choosing from 5 positions to suit your viewing angle, you can lay it flat, and in portrait you can spin it left or right - whichever way you choose. This case will securely hold you device using the discreet velcro anchors, simply flip around the cover and snap the stand into a comfortable upright position, allowing you to work away without the risk of knocking it over whilst tapping on the screen the screen.This Tuff-Luv product qualifies for our lifetime guarantee against faulty workmanship / materials - conditions apply. 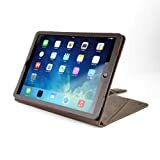 The Tri-Axis is the product of 3 years' of feedback from customers to improve the design of this multi-functional iPad Air 2019 / iPad pro 10.5 (2017) case.Originally nominated by MacWorld for their 2010 for Best iPad Accessory".This case offers complete protection for your device in the event of a drop and scuff, and looks stylish with a cutting-edge design. If the basic offering of an official "Magnetic screen protector iPad case" is not for you, then the Tuff-Luv Tri-Axis design is a must-have for your iPad Air 2019 / iPad pro 10.5 (2017)!This great new case includes Tuff-Luv's latest "Stasis" feature to automatically put your iPad Air 2019 / iPad pro 10.5 (2017) to sleep when shut, making sure you conserve your battery power when you're on the move.The versatile stand allows you to adjust the cases into 8 different positions to securely support your device no matter how or where you are using it. You can stand it up in landscape, choosing from 5 positions to suit your viewing angle, you can lay it flat, and in portrait you can spin it left or right - whichever way you choose, we've got you covered. 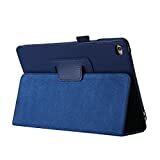 This case will securely hold you device using the discreet velcro anchors, simply flip around the cover and snap the stand into a comfortable upright position, allowing you to work away without the risk of knocking it over whilst tapping on the screen the screen.This case is specially designed to fit your iPad Air 2019 / iPad pro 10.5 (2017).This Tuff-Luv product qualifies for our lifetime guarantee against faulty workmanship / materials - conditions apply." Here is a wonderful and unique opportunity to have your name professionally laser-branded onto this case in a choice of fonts. * For eBay orders, during checkout - click the add message"* For Amazon orders, in the checkout tick the box "this will be a gift" and provide your detailsa) Text: What you would like engraved (your name).b) Font: In what font? Please refer to the image and advise the number of the font you require (e.g. font 1, font 2).c) Position: See image for placement options (e.g. B-UR for back, upper right).d) Please send your personalised details within 48 hours. If no details are received within this time, your case will be sent without a laser service. If no font is chosen, we will use the default #5 font.Use the following format:Position: F-UM, FONT: 2, TEXT: To Dad / From Joe (/ = New line)There is no maximum character length, but the font size will be reduced to accommodate longer text.Please note that because of the nature of the personalisation we are unable to accept returns due to change of mind reasons.Also note this offer only pertains to text printed on one side / surface. 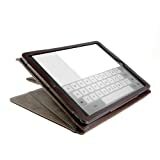 For multiple sides please contact us.Please allow 2-3 days extra in delivery time.Our premium case includes a sleep function to conserve your battery when your tablet in use.The versatile stand allows you to adjust the cases into multiple different positions to securely support your device no matter how or where you are using it. You can stand it up in landscape, choosing from 5 positions to suit your viewing angle, you can lay it flat, and in portrait you can spin it left or right - whichever way you choose, we've got you covered. 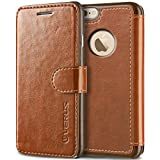 This case will securely hold you device using the discreet velcro anchors, simply flip around the cover and snap the stand into a comfortable upright position, allowing you to work away without the risk of knocking it over whilst tapping on the screen the screen. 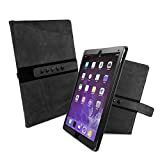 This great flip style case is excellent value for money and is a great an easy way to protect your iPad Pro 12.9". 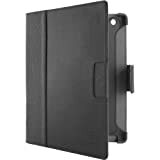 Your tablet is held securely using a secure harness and of course the front cover protects the screen when not in use. You simply fold that cover and lock it into position to use the landscape stand. 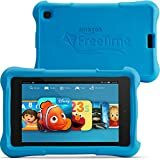 The case gives you complete access to all the ports and functions you need and protect the tablet from all the bumps and scrapes which can happen at the bottom of your bag. The Tri-Axis is the product of 3 years' of feedback from customers to improve the design of this multi-functional iPad Pro 10.5 case.Originally nominated by MacWorld for their 2010 for "Best iPad Accessory".This case offers complete protection for your device in the event of a drop and scuff, and looks stylish with a cutting-edge design. 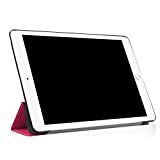 If the basic offering of an official "Magnetic screen protector iPad case" is not for you, then the Tuff-Luv Tri-Axis design is a must-have for your iPad Pro 10.5!This great new case includes Tuff-Luv's latest "Stasis" feature to automatically put your iPad Pro 10.5 to sleep when shut, making sure you conserve your battery power when you're on the move.The versatile stand allows you to adjust the cases into 8 different positions to securely support your device no matter how or where you are using it. You can stand it up in landscape, choosing from 5 positions to suit your viewing angle, you can lay it flat, and in portrait you can spin it left or right - whichever way you choose, we've got you covered. 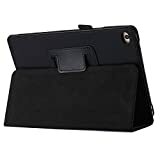 This case will securely hold you device using the discreet velcro anchors, simply flip around the cover and snap the stand into a comfortable upright position, allowing you to work away without the risk of knocking it over whilst tapping on the screen the screen.This case is specially designed to fit your iPad Pro 10.5.This Tuff-Luv product qualifies for our lifetime guarantee against faulty workmanship / materials - conditions apply. 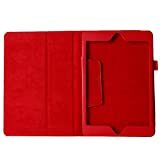 A sleek and compact case designed to protect your iPad Air 2019 / iPad pro 10.5 (2017), whilst adding some additional functionality.The red cover folds out across the screen of your tablet protecting it in transit... When you're ready to work simply, roll it up and use it as a stand for typing or watching your media.